The blueberries are coming! We’re just a week or two away from our first batch of mixed berry jam (Lily’s favorite) and blueberries for fresh eating. This year, I’ve got about 5 bushes with a good amount of blueberries and probably 10 additional smaller bushes with a little bit of fruit. I was all excited about the first berry, snapped a pic, and then ate it. 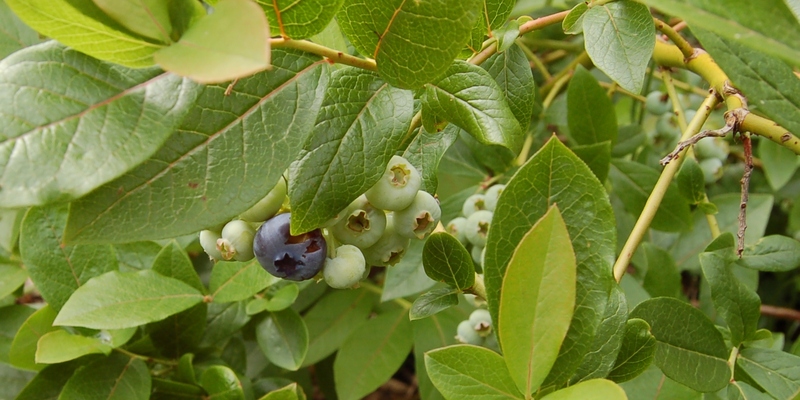 Of course, when I told Andrew (age 6) that I ate the first blueberry he told me he has already eaten two, but skipped the one with the “bug bites,” the one that I had. I should have known. He’s just like a small bear cub, harvesting berries as soon as they are ready. Another first this week: a Sungold tomato. Cherry tomatoes are often the first to ripen, so it’s not a surprise that this is the first variety to harvest. I have three Sungold plants this year. They are now about 10′ tall, trellised up a wood and twine structure in the greenhouse. I’m going to get a ton of these tomatoes! Methinks I’ll be making tomato jam again this year. One of the wine barrels is full of self-seeded pansies this year. 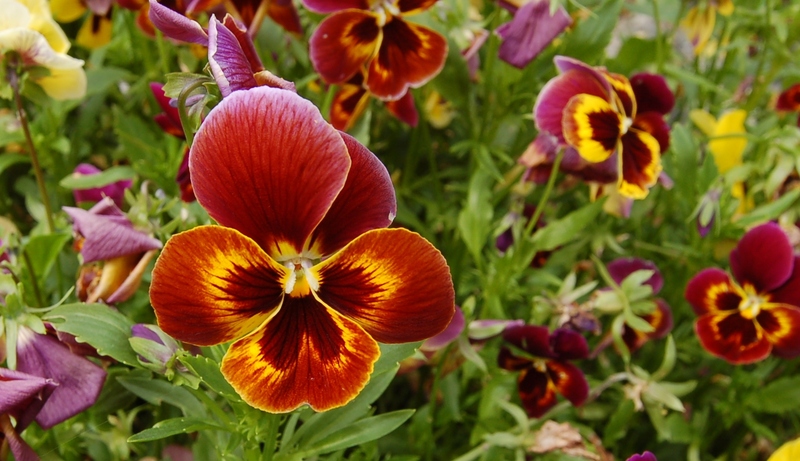 Originally, I had yellow and purple pansies, but these appear to be crosses. I didn’t intend to leave a barrel full of pansies, but these were too pretty to pull out. Plus, Lily’s guinea pigs like eating pansies, flower and all, so we pluck a few out for guinea snacks every now and then. Finally, yesterday I made a yummy batch of strawberry rhubarb jam. Canning season continues! This entry was posted in Gardening and tagged blueberries, pansies, sungold tomato, tomatoes. Bookmark the permalink. Sungolds are a very productive (but very yummy!) tomato. We grew them last year and really enjoyed them. I had to skip them this year because I wanted to try going Cherokee Purples one more time and so something had to rotate out to make room.